Welcome to the forum. I'm sure one of the forum experts on electrical problems will try to help you trouble shoot. Good luck. It could be on a circuit with a GFI breaker in the panel! You are joining a good group of folks here with good info to share. Sorry I can't help with the electric problem but I am sure someone will be along to give some info. Howdy and welcome to the forum. Where about in WY are you located? I'm in Rolling Hills (30 miles east of Casper) and if you're close I'd be happy to take a look at it and see what we can find. I’m up your way several times a year and have several good friends in Cody. Our first reservation for the summer is a week at Wapiti campground. I see a lot of friendly chatter, but no advice on the outlet problem. I don't have a motor coach so treat my advice accordingly. An outlet with a GFI label on it and does not have a reset or test button is unlikely to be the problem. It is daisy chained with one that does or the service panel has a GFI circuit breaker. Continue looking for an outlet with a reset button. Some owners have reported finding the resettable outlet behind a refrigerator, or on the other side of a nearby wall. You could have one in an under side compartment. On the other hand non-GFI outlets have been known to fail. Sometimes it is a loose screw connector. Sometimes it is a loose crimp connector, or worse a twist on connector. The loose or corroded connector may be on a nearby outlet that is daisy chained with the non-working one. I was going to buy a new switch ... now, I am going to take your advice and keep looking. Perhaps someone out there has a '97 Nash and can help lead me to finding another reset button. Truly appreciate your knowledge and help. Another welcome from a fellow Wyoming resident!!! Anyhow, if that is actually a GFCI plug it should have the test and reset button on it. Does it just have a little sticker that states it is GFCI protected? If so that could be a wiring issue in either that plug or the actual GFCI that controls it. I also have one similar in my 99 Layton and it is controlled by the GFCI over by the table. 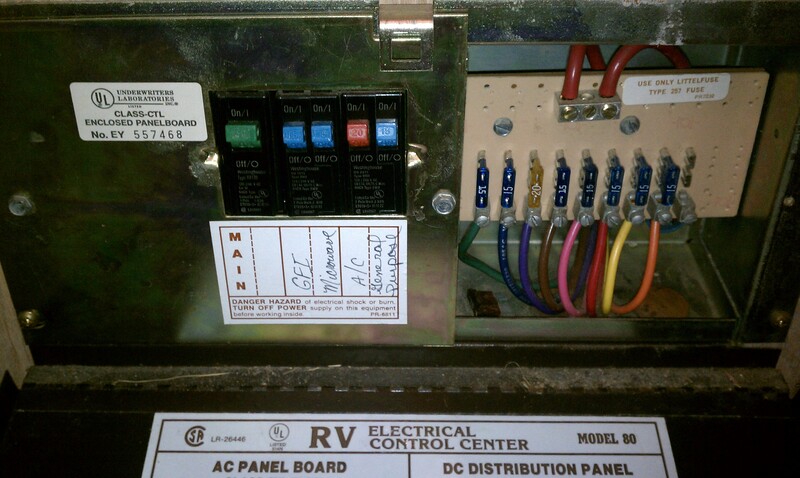 Hopefully this is stating the obvious in a rude way, but did you by chance look in the breaker panel? It likely has a separate breaker and possibly even a reset button in the panel. To the greatest forum. Don't be afraid to ask a question because someone will have an answer for you. There's a wealth of knowledge out here.